Twin Peaks is an American indie-rock band from Chicago, Illinois. The band was formed in 2010 and consists of Cadien Lake James (vocals, guitar), Clay Frankel (vocals, guitar), Jack Dolan (vocals, bass), Colin Croom (keys, vocals, guitar), and Connor Brodner (drums). Cadien Lake James formed the band in 2010 with childhood friends Jack Dolan and Connor Brodner when they were still in high school. James and Dolan attended Jones College Prep, while Brodner attended Lane Tech High School with Frankel, who later joined the band. Before Frankel played with Twin Peaks, he was in a different group called Crash Hero; James said in an interview, "We ended up stealing him from his other band." According to James, Twin Peaks is named after the restaurant chain of the same name. James' older brother Hal was the drummer for fellow Chicago band Smith Westerns. While in high school, James and Dolan were among a number of students who received ten-day suspensions for smoking marijuana; one of the other students was their friend Chance the Rapper, who later named his first mixtape 10 Day after the incident. Twin Peaks arose out of Chicago's DIY music scene, attending and eventually playing DIY shows in houses throughout the city. Frankel lived in one of the better-known spaces called Animal Kingdom. James, Brodner, and Dolan started attending these shows when they were 15, getting to know the members of bands like White Mystery, the Yolks, and Magic Milk. After graduating high school, all the band's members save for Frankel attended The Evergreen State College in Olympia, Washington, but later dropped out to pursue music. Soon enough the band started to outgrow the Chicago DIY scene. The band's first recorded project, led to it being labeled the "next big thing" by NME. In 2012, the band recorded their debut album, Sunken, in James' basement using "a crappy iMac from 2004, a broken digital mixer, and a digital recording studio from the '90s". The 20-minute album, named after a park in Chicago where the band members used to drink as teenagers, was released on July 9, 2013 through Los Angeles-based independent record label Autumn Tone Records. People began to approach the band to sell the album on vinyl. James explains that “the album deals with a lot of insecurities that arise when you’re growing up.” The music video for "Making Breakfast", a song on the album written and sung by Frankel, was released in October 2014. The band had a breakout performance at Pitchfork Music Festival in July 2014, just before Wild Onion was released. Prior to the festival, James broke his foot at an Orwells concert in New Orleans and had to play from a wheelchair. The performance received a lot of press and some called it the best set of the weekend. The following summer, Twin Peaks played Lollapalooza for the first time. Band member Cadien Lake James at Pitchfork Music Festival in 2014, in a wheelchair due to having suffered a broken foot. Twin Peaks' first European tour was in February 2015. In addition to club shows, they played several house parties in the UK. They later released a tour film documenting the trip. They also returned to Europe that summer to play both Roskilde in Denmark and Reading & Leeds festivals in the UK. In September 2015, Twin Peaks went on tour supporting WAVVES in N. America. Twin Peaks recorded the bulk of their third album Down In Heaven in August 2015 at a friend’s house in the Berkshires. R. Andrew Humphrey returned to co-produce and John Agnello later mixed the album in NYC. The first single "Walk to the One You Love," was written by James and released on February 1, 2016, along with the album's announcement. The second single, "Butterfly," released on March 30, 2016, was written by Frankel during SXSW 2015 when he was in a "sickened state." The third single "Holding Roses" was released on April 19, 2016. Down In Heaven was released on May 13, 2016, and the band went on tour to promote its release. The band made their late night TV debut on Conan, where they performed “Walk to The One You Love” in June. This album expanded their reach and led to their first tour of Australia, as well as tours supporting Cage the Elephant and Portugal. The Man. They also played Bonnaroo for the first time in June 2016 and played Pitchfork Festival for the second time in July 2016. In 2016, following the Chicago Cubs World Series Championship, Twin Peaks played the team’s trophy party. The Cubs, Theo Epstein, Bill Murray, and Eddie Vedder were all in attendance. On May 5, 2017, Twin Peaks released a live double LP titled Urbs in Horto. The album features recordings from the band’s shows at Metro and Thalia Hall in Chicago from December 2016, where they closed out a big year by selling almost 3000 tickets in their hometown. The album includes songs from across the band’s three studio records, as well as a cover of The Rolling Stones' "Dead Flowers." Urbs in Horto was recorded to tape. Beginning in July 2017, Twin Peaks released two new songs every month through December 2017. They titled this project Sweet ’17 Singles. 7" vinyl singles were sent to the 300 subscribers each month and the tracks were also made available digitally. James also produced and record the debut extended play (EP) by Calpurnia, Scout. The band's musical style is regarded as a mixture of "'60s garage rock and the 2010s garage punk sound." Jayson Greene of Pitchfork stated that the band "spends half their time as a chugging power chord factory and half as a winsome power-pop band." The band's musical style on their debut album has been described as "sloppy, Replacements-inspired rock" while the band's second album features "a garage-rock sound that touches on everything from fuzz-soaked psychedelia and punk to ballads and baroque pop." 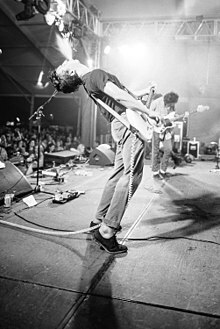 The band's influences on the album include garage rock acts such as Black Lips, Jay Reatard, Ty Segall and The Strokes, and rock artists such as the Beatles, The Stooges, The Beach Boys, and the Rolling Stones. ^ "Artist Of The Week: Twins Peaks • r/portugaltheman". reddit. Retrieved 2017-11-16. ^ a b "Twin Peaks's Chicago Pride - Interview Magazine". Interview Magazine. 2013-07-08. Retrieved 2017-11-16. ^ Dunning, JJ (November 2014). "Q Introduces". Q. No. 340. p. 19. ISSN 0955-4955. ^ Terry, Josh. "We closed out our Lollapalooza weekend with a surprise Chance the Rapper show at Metro". RedEye Chicago. Retrieved 2017-11-16. ^ Terry, Josh. "Interview: How Twin Peaks' best summer ever made their new album 'Down In Heaven'". RedEye Chicago. Retrieved 2017-11-16. ^ "Twin Peaks Is the Next Big Rock Band Out Of Chicago". Chicago magazine. Retrieved 2017-11-28. ^ "Twin Peaks 'Wild Onion' Album Review". Rolling Stone. Retrieved 2017-11-28. ^ "Twin Peaks - Wild Onion" (PDF). Pitch Perfect PR. ^ Ingegneri, Katie (2015-09-24). "Rock n Roll Bodhisattva: Cadien Lake James of Twin Peaks". Medium. Retrieved 2017-11-28. ^ "How Did The Orwells' Crippling Twin Peaks Make Their Pitchfork Set Even Radder?". MTV News. Retrieved 2017-11-28. ^ "Twin Peaks Share New Song "Butterfly," Extend Tour: Listen | Pitchfork". pitchfork.com. Retrieved 2017-11-28. ^ "Eddie Vedder, Bill Murray, And Twin Peaks Had One Big World Series Party This Weekend". 2017-01-09. Retrieved 2017-11-28. ^ Sendra, Tim. "Twin Peaks". AllMusic. Retrieved November 17, 2014. The album was later released in Europe by Communion. ^ Greene, Jayson (August 6, 2014). "Twin Peaks - Wild Onion". Pitchfork. Retrieved November 17, 2014. ^ Kot, Greg (October 16, 2014). "Twin Peaks is peaking at the right time". Chicago Tribune. Retrieved November 17, 2014. ^ Sendra, Tim. "Twin Peaks - Wild Onion". Allmusic. Retrieved November 17, 2014. ^ DeVille, Chris (August 5, 2014). "Band To Watch: Twin Peaks". Stereogum. Retrieved November 17, 2014. ^ "Twin Peaks - Stand in the Sand". YouTube. 5 January 2014. Retrieved 25 June 2016. ^ "Twin Peaks - "Flavor" (Official Video)". YouTube. 26 June 2014. Retrieved 25 June 2016. ^ "Twin Peaks "I Found a New Way" (Official Video)". YouTube. 7 August 2014. Retrieved 25 June 2016. ^ "Twin Peaks - Mind Frame (Official Video)". YouTube. 24 November 2014. Retrieved 25 June 2016. ^ "Twin Peaks - "Making Breakfast"". YouTube. 20 October 2014. Retrieved 25 June 2016. ^ "Twin Peaks - Walk To The One You Love". YouTube. 25 February 2016. Retrieved 25 June 2016. This page was last edited on 3 April 2019, at 01:04 (UTC).